Leading off: Tonight we're mocking up the 2009 NFL Draft on The Right Now Podcast, available on iTunes Friday morning. Now to the unproven . . . .
2. St. Louis Rams select Jason Smith, OT Baylor If your planning on focusing the offense around your former pro bowl running back, Steven Jackson, then you must replace Orlando Pace. I watched another former Virginia Cavalier, D'Brickashaw Ferguson, play for the Jets over the past several years, and I'm not about to select another Cavalier offensive tackle this high in the draft. Spagnuolo knows that, and with this pick he selects Jason Smith, the highly touted Baylor offensive tackle. Jason Smith is ready to jump to the pro's and make an immediate impact, look this guy won't need a ton of time to adjust, that's got to be what entices the Rams. We'll replace Marc Bulger and eventually find a franchise quarterback, but not this year. 3. Kansas City Chiefs select Tyson Jackson, DE Louisiana State Heads are spinning and general managers have phones ringing off the hook. Expect that when the Chiefs pass on Aaron Curry, the inside linebacker that would seemingly fit perfect in their new 3-4 defense. To select Tyson Jackson is to realize that adding veteran linebackers Mike Vrabel and Zach Thomas create something similar to what Pioli had created in New England. Turn back the clock, what was Pioli's first move to improve the Patriot defense? Draft stud defensive end Richard Seymour, whose turned in a fantastic career anchoring that Patriot defensive line. So here is another stud SEC defensive end, which instantly gives Kansas City a good pass rusher. As great as Aaron Curry is projected to be, and he is as advertised, don't expect Pioli to select him just because he seems like the obvious choice. Tyson Jackson at #3 would be a stunner here, but he's 6'4" and close to 300 lbs. and seems to be coveted by the Chiefs. 4. 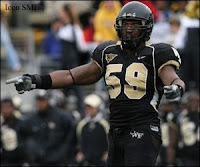 Seattle Seahawks select Aaron Curry, LB Wake Forest If he's available, this certainly makes the selection a whole lot easier for Seattle. Crabtree has a few questions surrounding him and his injured foot, it has to scare Seattle and Curry does fill a huge need with Julian Peterson now gone. Yes, I could see the Seahawks drafting Mark Sanchez and I think they'd really like to. However, Aaron Curry does anchor a defense that was playoff ready just over a year ago and with Hasselbeck in the fold again the Seahawks could be a year or more away from drafting a quarterback to replace him. Let's make no bones about it though, Aaron Curry is extremely talented and the Seahawks would be giddy to see the Cheifs pass on him or trade the pick for a team hungry to draft Mark Sanchez. The Seahawks have been awfully tight to the vest with their hand and when you could draft multiple ways that is what you have to do. 5. Cleveland Browns select Brian Orakpo, DE Texas Michael Crabtree still on the board and Cleveland passes? Donte Stallworth headed for prison. Kellen Winslow traded to Tampa Bay. Rumours swirling around the future of Braylon Edwards possibly being traded to the Giants. All those questions and YES I still think Mangini is passing on Michael Crabtree. The Browns will address their receiver needs with whatever they get in exchange for Edwards, most likely a late first round draft pick. Orakpo however does fill a need for the Browns. As I said in early March they were ranked 27th in the league in yards allowed per game and tied for 30th in the league for sacks at only 17. Draft Orakpo, he's a 6'3", 260 lb. 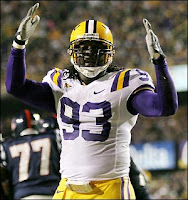 end, I think that would improve on the pass rush and hopefully improve on that sack total. 6. Cincinnati Bengals select Eugene Monroe, OT Virginia Let Carson Palmer and Marvin Lewis cross their fingers, hoping that Eugene Monroe can lock in and anchor their offensive line. You want to eek out those last few years in Carson Palmer's frail legs then you've got to put someone young and athletic enough in place to protect him. Hopefully Eugene Monroe is that guy. Levi Jones is most likely the odd man out and Monroe will be forced to improve his good but not great foot work. I'm aware that Michael Crabtree still remains available, a part of me thinks this solves their Ocho Cinco problem, also gives Palmer a more stable target, however if he can't get a pass off then it doesn't matter who is catching the ball. Eugene Monroe is the second offensive lineman off the big board to the Bengals. 7. Oakland Raiders select Michael Crabtree, WR Texas Tech I don't even really know how sold I am on this selection. I don't want to believe that Michael Crabtree, the most talented player in this draft, drops out of the top five because of a foot injury which won't impact his play in his rookie season. However, if your investing millions of dollars I understand why teams are nervous about taking that risk. Al Davis was all set draft the Georgia Tech defensive end, Michael Johnson, and then Crabtree took a tumble out of the top five. This pick can work out great for the Raiders, especially if they utilize all of his talents. Mike Crabtree is a playmaker, this could be the type of playmaker that gives Oakland fans something to cheer about. But wait just one second, doesn't this team need defense? Doesn't this team need to find a run stuffer? Here's the thing they should be drafting B.J. Raji, not Michael Crabtree, not Michael Johnson, they need to draft a player whose going to shut down the middle. But this is Al, and he doesn't draft for need he drafts for excitement. 8. Jacksonville Jaguars select Mark Sanchez, QB Southern California Keep him, don't you dare trade him to the Jets or Redskins. Don't start offering your selection for the highest bidder because your afraid you don't know what your going to do with him. Sanchez is an exciting player, David Garrard is not a franchise quarterback at this point, and he isn't getting any younger. You shelf Sanchez for the season and let him back up Garrard, when he gets his shot he'll be ready to play and with less pressure than it would be to come in as a starter from jump. However, if Jack Del Rio is coaching to keep his job this season than he may want to get the most he can in an effort to make more than one or two improvements. If that's the case then I take as much as I can get from Washington, Daniel Snyder is the perfect guy to give you a king's ransom. Keep in mind Jaguar fans, there is a reason people are excited about Mark Sanchez, he is a performer of the fans in seats variety. 9. Green Bay Packers select B.J. 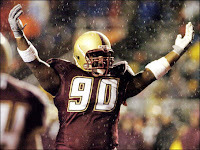 Raji, DT Boston College I don't see how this can be anybody else, especially given that the Packers need Raji's size to be the centerpiece of their 3-4 defense. Now that Raji's name has been cleared by Sports Illustrated for leaking a failed drug test which never actually happened, downside? You find one, I can't. Ted Thompson knows that a guy with Raji's size (6'1", 340 lbs.) really demands attention from blockers leaving A.J. Hawk available to make big plays from the linebacker spot. Not only is Raji an earth mover, in 2008 he had 11 tackles for a loss, something the Packers have desperately needed as of late. 10. San Francisco 49ers select Michael Oher, OT Ole' Miss Michael Oher is the best offensive lineman available, with questions surrounding the 49ers quarterback spot and Frank Gore being injury prone, its best to select an offensive lineman you like. For the people who have anyone from Aaron Maybin, Everette Brown, and even Brian Orakpo going here, yes the 49ers do need those type of players for their defensive scheme but I just don't think that you can miss with Michael Oher. Oher is a young athletic offensive lineman, he's been all over the top ten draft board and the 49ers and Singletary would like to not reach in the first round for top draft picks. As long as Oher is availble I believe the 49ers will go offensive line here. What?!?! You thought I was giving you 1 through 32 now? If your looking to find out who we're mocking up, all 32 first round picks and much more will be available by listening to The Right Now Podcast, the official podcast of LynchyRightNow.Com on Friday morning. As always you can download the final 2009 NFL Mock Draft episode and many more on iTunes, just search for The Right Now Podcast. Stay tuned for Keep It Real Friday tommorow morning, and remember to stay between the lines.